Start paring down the master closet. “This house has way too much storage!” said NO BUYER EVER. It probably goes without saying that an empty closet shows better with buyers than one packed full of clothes and miscellany. That being said, emptying all the closets is not practical for most homeowners so concentrate your efforts on THE most important closet in a home buyer’s decision-making process: the master bedroom closet. Organize, eliminate, and get stuff off the floor. For more detailed info on how to organize your closet for staging, check out our book, Just Right! Easy DIY Home Staging for Bedrooms & Closets, now available in the iBooks store. Begin de-personalizing. Buyers need to be able to walk into your home and easily envision their family living there — not reminded that they are a guest in someone else’s home. Start packing family photos, collections, sports memorabilia, and anything related to your hobbies or religion. This may feel especially difficult during the holiday season, but if you plan on listing at the first of the year, set yourself up for a faster sale by starting the de-personalization process NOW. Take care of any maintenance, repairs, or updates. Leaky faucets, that one light switch that doesn’t work, the places on the wall that need touch-up paint…the list goes on and on for most homeowners. NOW is the time to start updating or fixing all those things you’ve been putting off. One trick we use with our clients is blue painter’s tape — just stick a small piece on every spot in your house that needs maintenance or updating. The tape pieces are a constant visual “to-do” list that you can work on in the months leading up to your listing. When it comes to preparing your home for sale, it’s extremely hard for most sellers to be objective about their own home. Hiring a professional home stager to do a guided Walk and Talk Consultation or even just having an honest, heart-to-heart discussion with your real estate agent a month or more BEFORE you list your home will give you more time to make the changes needed to get you a faster sale and a higher profit. Ready to get started? Call Three Bears Home Staging in Katy, TX at (832) 377-0785 to set up a consultation. January is the perfect time for a fresh start in your home! Whether you plan to stay put or you’re getting ready to sell your home, start the new year off right by getting organized and enjoy the benefits of a neater, easier to maintain home. Stop adding clutter. Avoid making bulk purchases or stocking up on sale items before putting your house on the market so that you’re not filling up closet and shelf space. Start purging. Use a couple of large bags or bins to collect items you can donate or sell (eBay, garage sale, Craigslist, whatever works for you). I keep a box in my trunk for regular collection of items I intend to donate to charity so that I can go straight to the drop-off location as soon as it’s full. As you’re making decisions about what to keep and what to pack, ask yourself, “Do I love it? Do I use it?” If the answer to both is no, you should probably seriously consider whether it’s worth packing and moving with that item. Focus on one project at a time. Getting ready to move can be overwhelming, so don’t try to tackle everything at once. Clean out one closet completely before moving to the next. Toss out expired pantry items and get rid of excess in the junk drawer, but do it one project at a time. Deal with paper. Paper clutter can inundate us quickly. File or store the important documents properly and shred outdated items. Other items can be scanned and stored digitally, taking up much less space. Getting organized is an important first step in getting your home ready to sell. If you need help getting started, give Three Bears Home Staging & Redesign a call at (832) 377-0785 or contact us here. My husband and I have three children and a dog; consequently, we spend a LOT of time in the laundry room each week. It’s busy in there, and it gets chaotic. We all have to do laundry. For most of us, it’s not a room we choose to spend a lot of time in. Remember, though, when selling your home, staging is all about romancing potential buyers–not reminding them of chores or a lack of storage space. Keeping the laundry room clean, bright and organized when selling will maximize its appeal! So what’s the best way to show off your laundry room? De-clutter. This is the number one task when it comes to laundry rooms. Often these spaces end up becoming catch-alls for cases of water, boxes of art supplies or a 50-lb bag of dog food, in addition to piles of shoes and dirty clothes. HIDE IT OR GET RID OF IT. If you’re selling your home, you’re eventually going to have to pack up most of that stuff anyway. Clear off counters and shelves, remove hangers — keep only the barest of essentials in this room. Use pretty baskets or boxes to organize what’s left behind. Clean and brighten. Dust and dryer lint builds up easily in this room. Wipe down appliances and mop floors. Check the walls for scuffs and re-paint if necessary. Also, consider using higher wattage bulbs if the lighting is dim. Check for odor. Who doesn’t love the clean smell of fresh laundry? An easy way to give the laundry room the same fresh clean smell is to use dryer sheets in between some neatly folded towels (like in the picture). Conceal dirty laundry. Let’s face it–nobody wants to be touring a home and unexpectedly see piles of dirty underwear. Make sure dirty laundry is completely concealed in the hamper. Have clean laundry that hasn’t been folded yet and no time to put it away before a showing? Toss it back into the dryer and out of sight until you can get to it! 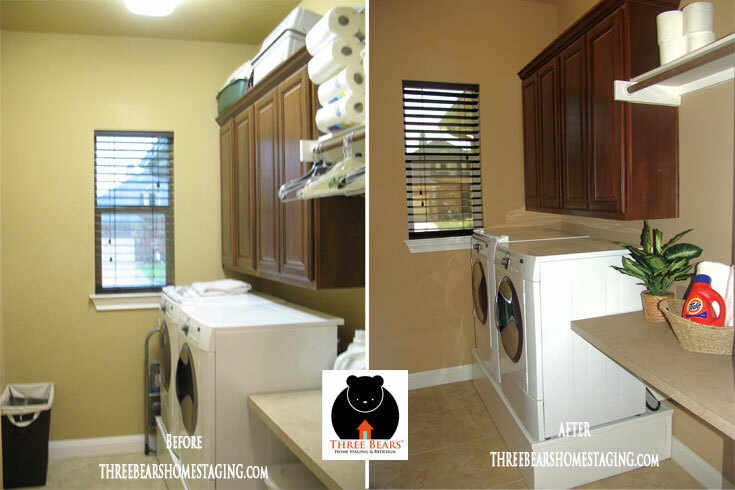 As a professional home stager, I can tell you the laundry room is by far the number one most neglected space by homeowners when it comes to staging. Buyers WILL open the door to this room, and they WILL make snap judgments about it. A space that feels cluttered with little room to move will not make as favorable an impression as one that is clean and spacious. Need help getting your space in shape? We can help! Give us a call at (832)377-0785 or contact Three Bears Home Staging and Redesign online today to schedule a consultation!